After being chained to a star to burn endlessly as punishment for stealing immortality from the gods, Jaykun has been unshackled to wage war alongside his brothers. But his freedom comes with a price: Each night Jaykun must still suffer—his body burning from the inside out. One early morning, recovering from his torment, he encounters a beautiful stranger on the beach. Naked from her midnight-black hair to her sandy toes, she approaches him with starry-eyed innocence and the unmistakably full body of a woman. Soon Jaykun is swept up with the force of a comet, his desire for this woman hotter than any sun. His brothers fear he is blinded by her radiant beauty, and that she has been sent by their enemies to seduce and destroy him. Jileana is indeed from another world—one Jaykun cannot begin to imagine. But will their passion burn brightly enough to light the way through the darkness that threatens to consume all in its path? 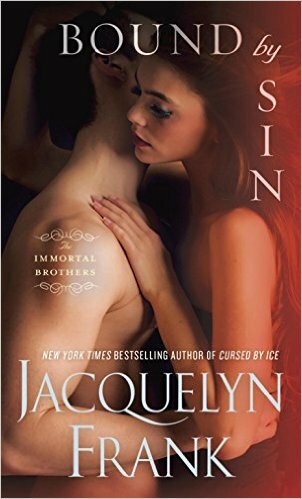 Jacquelyn Frank’s ‘Bound by Sin’, is a really good read. 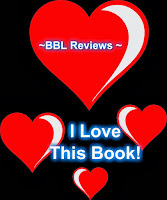 It is part of the Immortal Brothers series but can be read as a standalone. You won’t be lost as you read because she does an excellent job of providing information to the reader. I enjoyed Jaykun and Jileana’s relationship. Jaykun has to burn every night as a punishment because of a wrong doing against the gods. During the day he has to campaign to spread the word of his goddess Weysa, while on a campaign against the city Kriza, he meets Jileana. He is at the cove where he decided to ‘burn’ for the night when he realizes that he is being watched. When he can see again, he finds himself being watched by Jileana. She is openly curious about the beauty of the man who burns like a star, that is until she realizes the pain he is in every time he must burn. As Jaykun and Jileana become closer, he finds out that she is not what she appears, but rather is a selkie. She lives on an island that is protected by storms so no one that is not invited can get on it. She invites Jaykun to the island and he accepts it in a diplomatic form, this way he can talk about the goddess Weysa while he is there. He becomes friends with the empress and helps her settle the problems that have been plaguing the selkies. While this book was good and the storyline was quite enjoyable, I found some areas to be rushed, while others seemed to drag. The interaction though between Jaykun and Jileana was very believable. The way the story was written made it seem like they had a lot of time to get to know each other, which is something I appreciated. While I enjoy the ‘insta’ love trope, sometimes it’s good to read about a pair that takes some time to really get to know each other.